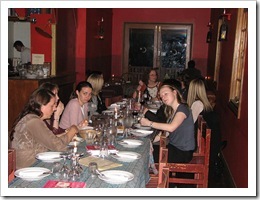 On the 28th of August 2008, about two weeks ago, Tim and I attended the Girl Geek Dinner in Brisbane which was held at a Turkish restaurant. 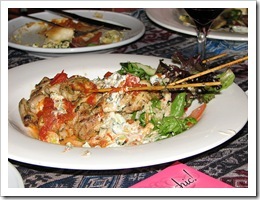 The food was amazing!! It was worth going that night just for the food, seriously. But, besides the food, it was really interesting to spend that time with other women who are also involved in computer related work. Some people showed up already knowing other people there, others showed up not knowing anyone… it was interesting to observe the different ways everyone interacted with one another. We’re all so different! I was pretty quiet, but I wasn’t afraid to make conversation with other people, I actually enjoyed talking to some of the other girls during the night. However different from me, some ladies were quite loud and outgoing. Some ladies moved around and talked to most of the girls who showed up, whereas others stayed in their own seat the whole night and just talked with the girls sitting near them. 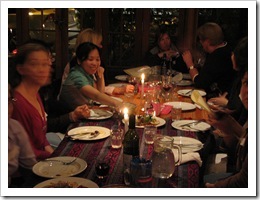 But either way, everyone seemed to really enjoy themselves and I’m certain everyone loved the food. There was one really long table booked and another table half the size. We could’ve fit another 10 or so girls at the table for sure, but apparently a lot of people had to cancel due to sickness and things like that, shame! The conversations were interesting. You may have expected everyone to discuss IT topics for most of the night, but that was hardly the case. Conversations between the six or seven girls seated near me did involve a fair amount of computer related topics but they went from so what work do you do in IT, to where abouts you’ve lived, to the Questacon science museum in Canberra, to peanuts, to the Bible, to political voting requirements, and who knows what else! It was pretty crazy. But I guess that’s how girls usually are anyway, all over the place! Never really focused on just one thing. It was fun. At the end of the night we were asked to fill out a survey, the survey had suggestions for different Girl Geek Dinners in the future having different activities and what not and was open to any suggestions. 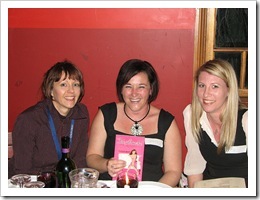 A Geek Girl named Jenine Beekhuyzen, who is actually one of the girls who organised the dinner and is continuing to put time and effort into making these events happen, has written a book along with Rebecca Dorries called “Tech girls are chic! (not just geek!)”.. 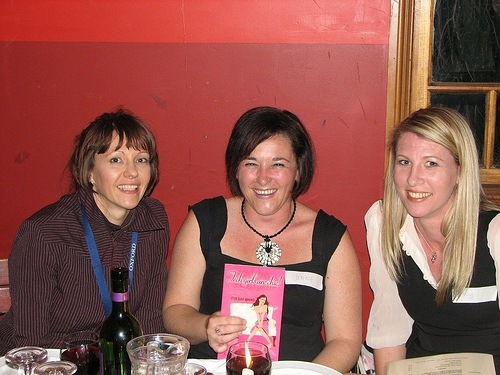 at the dinner Jenine had many free copies there for anyone to take, very generous! The book is really cool and I’m sure everyone who has made time to read it yet has enjoyed it. 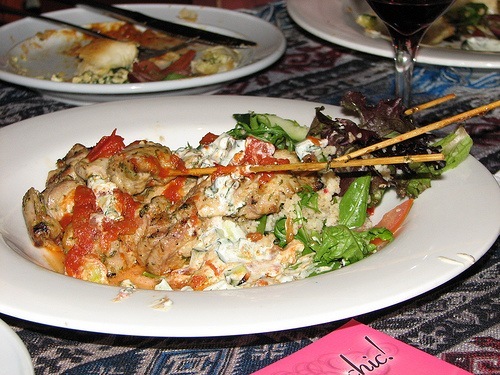 All up, I’m sure everyone went home with satisfied taste buds and memories of an enjoyable night. 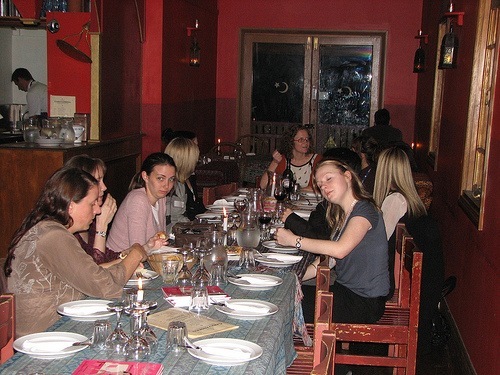 A lot of people said they looked forward to the next Girl Geek Dinner, and I’m sure we’ll see a lot of now familiar faces next time the Girl Geek Dinner is held. It really was a fantastic opportunity to meet other women in IT, support and encourage one another in different areas, and really just enjoy a fun night out with other tech girls! The girls who blog were shocked to hear that a lot of the other girls didn’t blog, which was amusing. Goes to show you don’t have to blog to be tech as well as you don’t actually have to be tech to blog! 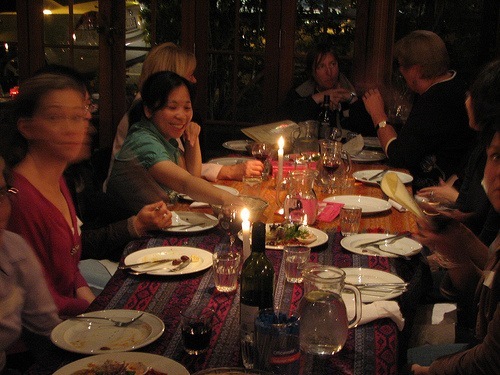 A big thank you to Bronwen Zande and Jenine Beekhuyzen for organising the dinner. 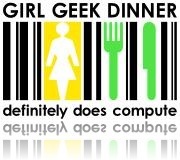 If you are interested in attending any future Girl Geek Dinners just keep an eye on the Girl Geek Dinners Brisbane site for info. Good food and drink makes for a great conversation regardless of the occasion, Let's face it there is a lot to be said about good food and drink period and with good company makes for a geat time. male or female. I also had a great time and am looking forward to the next one! It's great to meet people who understand where you're coming from, and are inspirational and motivate you! The best part of all, I was offered (and of course accepted) a job doing exactly what I've wanted all my career. The saying holds true of being at the right place at the right time, and it's refreshing to see companies give people a chance to prove themselves and pursue their dreams! Great to have you on board Kitty! It was fortuitous indeed that I sat next to you at dinner! I'll have to get your email address off Tim so I can talk to you about the next dinner, there's a job Tim wants you to do, he may or may not have talked to you about it yet.